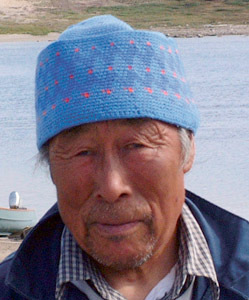 Born in 1942, in a small hunting camp near Inukjuak. Lucassie Echalook began carving to help support his family during the difficult years that followed the death of his father in 1950. Along with Thomassie Echalook, Lucassie learned to carve by observing Thomassie’s brother, Peter. “This is why Thomassie and I have a similar way of carving,” he says (unpublished interview with Inuit Art Foundation staff, 2009). Echalook worked predominantly in sculpture, although he did draw, and he made stonecut prints, some of which were included in the 1975 Arctic Quebec Print catalogue and the 1976 Inukjuak Print Collection catalogue. Echalook often carves with long-time friend and fellow carver Daniel Inukpuk. Whenever either artist prepares to carve a human figure, they begin first by observing the other’s movements and positioning of body. Although Echalook favoured hunting scenes, he abandoned this subject when Greenpeace mounted its highly publicized campaign against the killing of seals. His later work includes spirit figures and shamanic transformations. Echalook’s sculpture is usually a solid mass with few open spaces; his narrative scenes are compact, as if part of a single form. “An unusual feature of his sculpture is that he often aligns details, such as hands or faces, along the foreground edge, and his figures’ anatomical features are distorted into angular planes that converge abruptly, creating an effect that implies movement” (Indian and Northern Affairs Canada 1997). Moreover, Echalook’s faces can often be distinguished by their “almond-shaped eyes, broad noses, and wide mouths” (ibid.). His sculptures are highly-polished, except for their bases. when his work was first shown in Eskimo Sculpture, an exhibition at the Winnipeg Art Gallery in 1967. 997 Inuit Artists’ Biographies. Gatineau: Indian and Inuit Art Centre, Indian and Northern Affairs Canada. 2006 “Metamorphosis: Eleven Artists from Nunavik,” Inuit Art Quarterly (IAQ), vol. 21, no. 3 (Fall): 30–34.